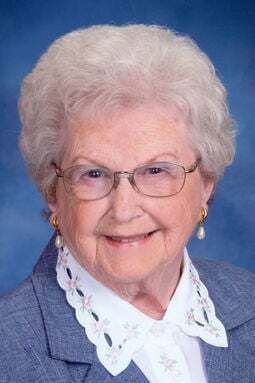 Lola Mae Denison of Fremont went home to be with her Lord on Sunday, Jan. 27, 2019, at Nebraska Medicine in Omaha. Lola Mae was born May 17, 1932, on the family farm east of Winslow, to Louis and Bessie (Barnhart) Wolf. She was baptized May 29, 1932, at her home by Pastor J.H. Gerdes of St. Paul's Lutheran Church, Winslow, Nebraska. She graduated from Hooper High School in 1949. She was a member of Immanuel Lutheran Church where she married William “Bill” Denison on Oct. 19, 1949. They farmed east of Winslow until retirement. They built a retirement home at Orange Blossom Gardens in Florida which was later renamed The Villages of Lady Lake, and spent their winters there, moving permanently in 1992. Bill passed away Jan. 2, 1993. She moved back to Nebraska on Jan. 27, 2010, and had since lived in Fremont. She is survived by daughters, Carol (Tom) Karlin of Beatrice, Joyce (Bud) Foust of Hooper; sons, Robert (Donna) Denison of Fremont and Daniel (Terri) Denison of Omaha. She was blessed with 11 grandchildren and 26 great-grandchildren, two stepgrandchildren and eight stepgreat-grandchildren. Preceding her in death were her husband, Bill, and two brothers, Berkley and Lyle Wolf. There is no viewing, however, the family will receive friends at the Ludvigsen Mortuary Chapel in Fremont on Thursday from 5 p.m. to 7 p.m. A memorial service will be 2 p.m. Friday at Trinity Lutheran Church in Fremont. The Rev. Dan Heuer will officiate. Memorials are suggested to Trinity Lutheran Church in Fremont, Trinity Lutheran Church Summerfield, Florida, Immanuel Lutheran Cemetery and Operation Shoebox (www.operationshoebox.com).